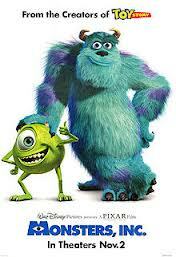 Adoption at the Movies : Adoption Movie Guide: Monsters, Inc. Adoption Movie Guide: Monsters, Inc.
For many kids, the scary monster is a vague notion of something in the closet or under the bed. Bottom-bunk siblings, it’s nothing personal. Think about Calvin and Hobbes, worried that “something under the bed is drooling.” For me, the monster was Doc. Yes – the dwarf from Snow White. I’m not sure why. Anyway, the monsters actually work together and use the fear of small children to power their city. It’s a pretty good plan for the monsters, except that they’re actually just as terrified of children. One monster tries to capture a child and torture her to get more screams, but he fails. Eventually, one monster figures out that laughter is even more powerful than terrified screams. 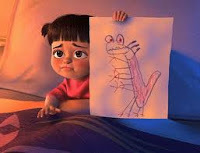 Monsters, Inc. doesn’t deal with adoption. It appeals to a general audience – because all kids have fears. For many kids who were adopted from foster care, though, the fears might not be tied to imaginary monsters, but rather to real people who abused them, or to real, traumatic events. The movie is, to some degree, a tale of a child triumphing over fear. It could be therapeutically useful to some children who have fears that are grounded in real historical events which are unlikely to be repeated. 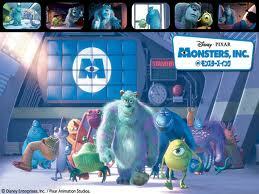 Monsters, Inc. turns the monsters of children’s nightmares into friendly, sympathetic, lovable creatures. Some put in dentures before going to work. They all have problems. They’re mostly furry and fuzzy. There are only two truly scary monsters, (and they’re the only real bad guys in the film) a chameleon and a spider . The movie’s resolution hinges on the thought that laughter is more powerful than fear. Scully and Mike, the two protagonist monsters, are lovable. Although this movie can be used to invite kids to externalize and face their fears, it won’t work for every child. Some fears are too deeply held to be dealt with through movies. Give it a try, but don’t be scared of seeking professional therapy if your child has a traumatic history. 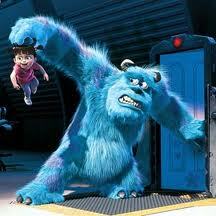 There are two scary monsters who villainously try to kidnap and torture a small girl. They never get her into their torture device (a scream-sucking machine), but one of their henchmen does feel the wrath of the machine, which leaves him pale. Monsters, Inc. is a cute movie for kids, and it can be used to enter into lighthearted, nonthreatening discussions about the things that make kids afraid. Try it with kids between the ages of 5-8. 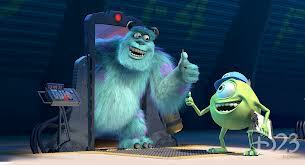 Do you think Sully is scary, funny, or both? What was something you used to be scared of but you’re not scared of any more? What are you still scared of? What makes you feel better? Craft: Just like Boo did – ask your child to draw “monsters and scary things.” Ask them to tell you what they drew. 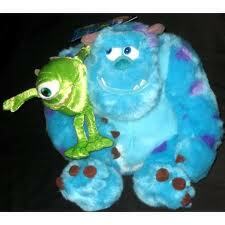 Craft: Buy a Sully or a Mike doll. Invite your child to write their fears down and staple them to the doll. Maybe use the drawings from the last craft. 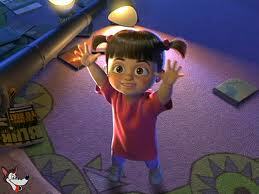 Let them do whatever they want with the doll – play with it, beat it up, throw it away, cuddle it. This might give them a way to externalize their fears and to view them as less scary. Note: These at-home activities might be helpful, but they’re not the same thing as trauma therapy. Don’t be scared to call a therapist if your child is exhibiting symptoms of having experienced trauma. Find this post helpful? Why not "Sit in the Front Row" by joining on Google Friend Connect. Also, check out Adoption at the Movies on Facebook!